Taking the train to your destination has some great advantages, but it can sometimes be a cramped, uncomfortable trip. This design from Chris Precht, which won second place in the Bombardier YouRail Design Contest, suggests a provocative new type of seating for trains: seats which can be pushed up and stowed out of the way when not in use. 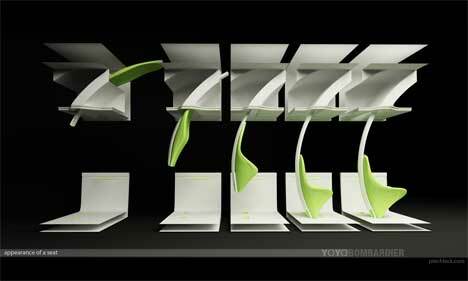 The YOYO design would allow a large amount of flexibility in the train carriage’s interior space. The seats which aren’t being used would no longer take up precious interior space, making it easier for passengers to move around or carry their bags along with them. The seats themselves are designed to be physically flexible as well, adjusting for passengers of different sizes and shapes. The idea behind the design is to keep the train carriage as open and undivided as possible. These “invisible” seats would always be available as the train fills up. But when density is low – or when passengers simply prefer to stand – the retractable seats remain neatly out of sight. 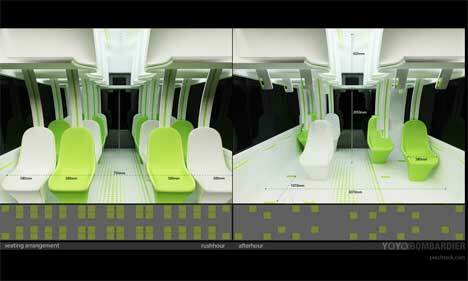 Retractable TV screens pull down to keep passengers entertained as they enjoy their journey. Whether or not this design could ever be implemented is questionable. After all, conventional trains are often populated with people who take up way more than their share of space. It’s not hard to imagine a family or group taking up half the carriage and refusing to let other passengers pull more seats down. But this design encourages us to look beyond the conventional configuration of a train carriage to a whole new user-friendly way of traveling, one where the passenger has more control over their commuting or traveling experience.